There are some Android applications that allow you to transfer data between your phone and laptop using the Wi-Fi network. When I say Wi-Fi network, that does not mean the internet network. You can just disconnect the broadband internet wire connected to your Wi-Fi router, because all it needs is the electricity to work. You can also use the inbuilt Wi-Fi functionality of your Android device. You just have to connect your laptop to the Wi-Fi network of your Android device. The process to turn Android into CCTV security camera will work without the internet, but it will be easy to authenticate the app, if you use internet. I hope you have not removed the broadband internet cable from your Wi-Fi router yet! Check, if your laptop and Android device are connected to the same Wi-Fi network. (A device connected to your Wi-Fi network is the part of your own local network. Anyone will need the username and password to be the part of this network). Install Airdroid from Google Play Store on your Android device. Open the app and touch the Start button. Open web.airdroid.com in the web browser on your laptop. Alternatively, you can download Airdroid for Windows, but there is no camera option in that software yet. Register with Airdroid. Create an account and log in to it. You can also just scan the given QR Code to enter. Scan the code from around 1 feet distance to scan it quickly. Put your Android phone in a proper place at the place you want to monitor. 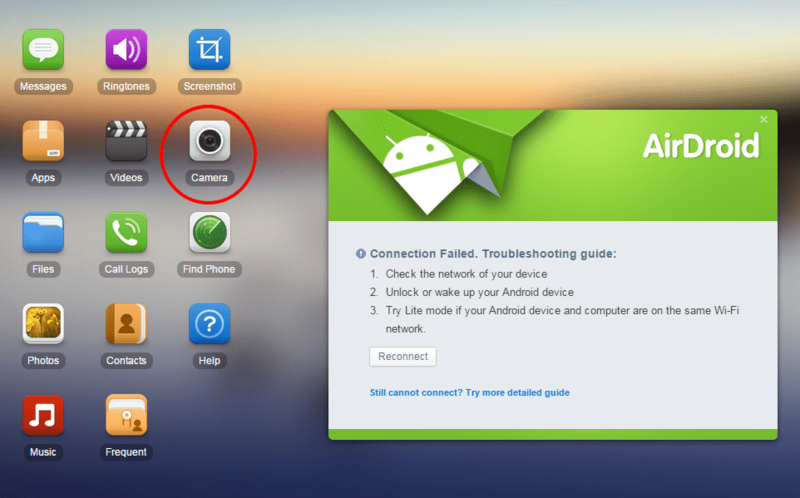 There is the Camera icon on the web interface (Laptop) of Airdroid. Click on that icon. AirDroid will automatically start the Camera on your Android phone. You will see the live stream on your laptop. Honestly speaking, Airdroid is currently not working on my side. There may be some network problem. But I have tested this process in the past. I have not observed a high quality uninterrupted video, but I do not know, if this was a network problem or Airdroid was the reason. There are actually many alternatives to Airdroid. If Airdroid do not work properly, you can try other apps. I wrote about Airdroid, because it is a popular app and I have personally not tried other similar apps yet. The purpose of this article is just to show that the technology allows you to turn Android into CCTV security camera. If you know a good alternative for Airdroid to stream live videos from camera over the Wi-Fi network, you can share your knowledge with our community. The comment box is all yours!